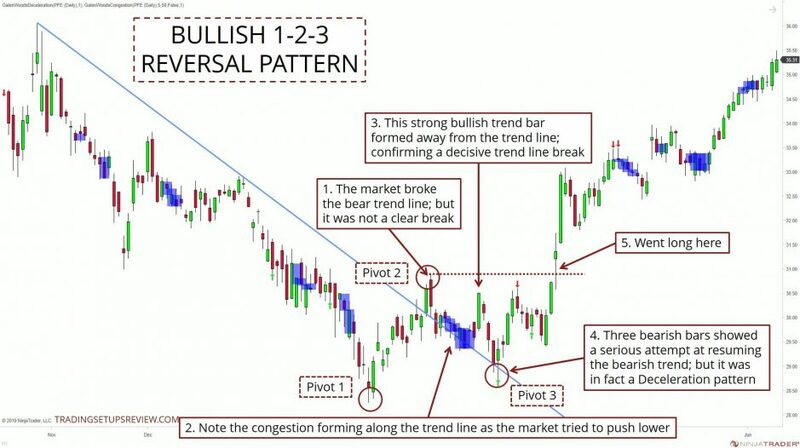 The 1-2-3 trading setup is a classic price pattern for trading reversals. Victor Sperandeo popularized it in his book – Trader Vic: Methods of a Wall Street Master. This excellent book offers more market perspectives than specific trading tactics. But the few setups discussed in the book are illuminating. This tutorial discusses my interpretation of the 1-2-3 setup for trading significant reversals. 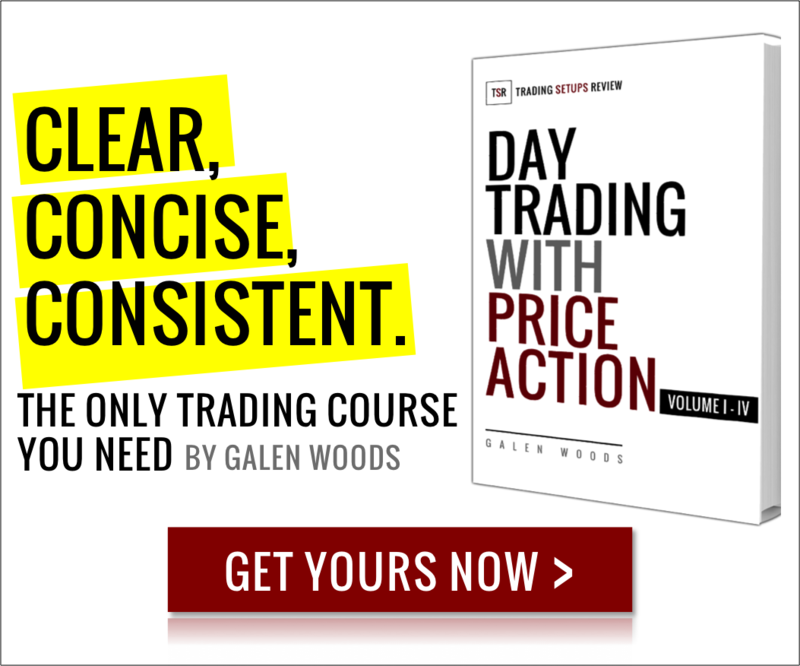 It might differ from the original formulation, so it’s a good idea to refer to Trader Vic’s book for his insights on this strategy. The diagram below shows a general 1-2-3 price pattern. To keep things simple, we’ll focus on a bearish 1-2-3 trading setup here. It focuses on catching a reversing bull trend by taking on a short position. Unsurprisingly, this pattern has three key pivots. Pivot 1 – The top of the existing trend. The 1-2-3 setup seeks to profit from the reversal of this current trend. Pivot 2 – The end of the retracement down. Look for retracements that break major bullish trend lines as a sign of bearish momentum. Pivot 3 – The end of the attempt to resume the trend. This point must not be higher than Pivot 1. Also, it’s ideal to see a serious effort to continue the trend. The failure of a serious attempt to resume the trend has more significant bearish notes than that of a weak attempt. Use Pivot 3 as a pattern stop-loss. 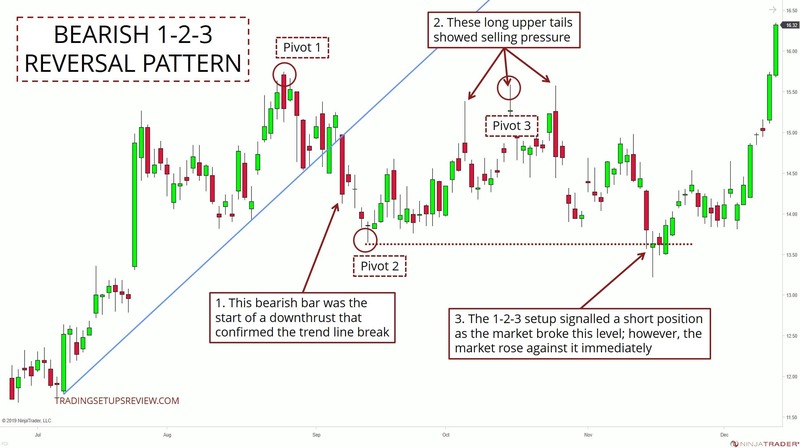 Now, let’s dive into trading examples with the 1-2-3 setup to understand how to apply it. The three circled points are the Pivot 1, 2, 3 respectively. The blue zones point out congestion zones. This bar broke the bear trend line. However, the price bars continued to overlap with the trend line, signaling an indecisive break. The market tried to resume the bear trend, but the congestion zones (in blue) showed that it was struggling. This strong bull trend bar made a real push away from the trend line. It was time to look for a serious attempt to resume the trend. Pay attention to these three consecutive bearish bars. If they had succeeded in pushing the trend lower, the 1-2-3 pattern would have been voided. However, in this case, the downthrust was a bullish Deceleration pattern. It is a pattern covered in my course; it implies weakness in a downswing. Indeed, the market bounced up, allowing us to mark our Pivot 3. The 1-2-3 trading setup fired a long position as the market broke above the level of Pivot 2. In isolation, this bearish bar did not signal a clear break of the trend line. However, it enjoyed followthrough. With this downswing, we could mark Pivot 1. From Pivot 2, the market rose and tried to resume the bullish trend several times. Each time, it was rejected as you can see from the long upper wicks of the candlesticks. As the market broke below the level of Pivot 2, the 1-2-3 trading setup gave the signal to short. Unfortunately, it turned out to be an inferior entry as the market rose immediately. No trading strategy guarantees performance. Hence, as a reminder, I always try to include a losing example in my reviews of trading setups. Some losing trades conform to attributes of a good trade. For those trades, overanalysis might do more harm than good. However, for some losing trades, it’s beneficial to figure out what went wrong. 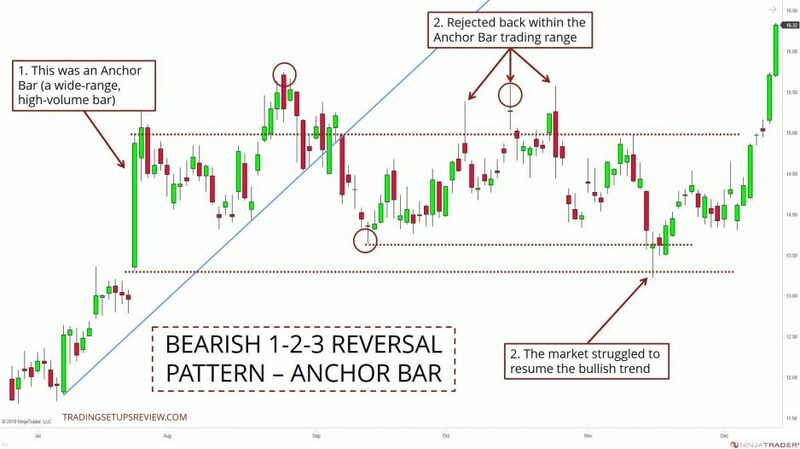 For instance, here, if you look to the left, you’ll find a significant price formation that we left out – Anchor Bar. An Anchor Bar is a wide-range, high-volume bar that has the potential to trap the market within its range. That was precisely what happened in this example. No reversal trading strategy catches every reversal. 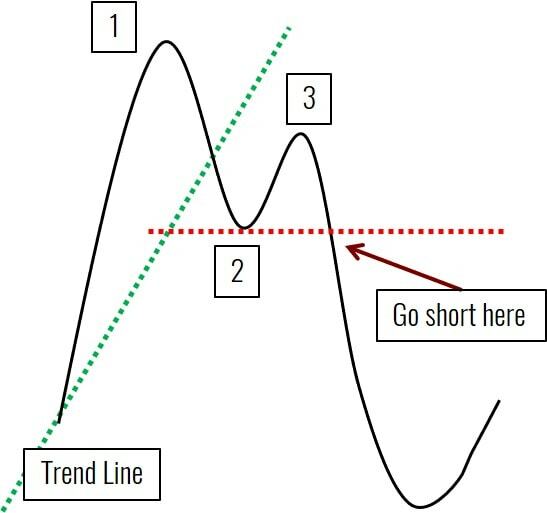 In fact, every reversal trading strategy will miss a large number of trend reversals. And that’s okay. Staying consistent is the key. Focus on what you understand. Trying to fit your strategy to catch every missed reversal is a recipe for disaster. Your trading strategy gets diluted, and you lose focus. Finally, classic price patterns like the 1-2-3 trading setup do not work out of the box. You’ll find it immensely helpful to experiment with different approaches. Look for preceding climactic volume that points to an exhausted trend. Trade pullbacks by finding minor 1-2-3 trading setups within a more significant trend. Tinker with entries and exits. Consider entering before the market breaks the level of Pivot 2. Also, try using tighter stop-losses based on price patterns or volatility. Hello Pradhap, there is no fixed target method here as it’s supposed to aim for a trend reversal. Since our aim is to profit from a new trend, it makes sense to employ a target-taking strategy that allows us to profit from powerful new trends. This means using more aggressive methods of letting profits run. Some ideas are trailing stop-losses based on major pivots and Chandelier Stops. You can also exit when you have a 1-2-3 pattern in the opposite direction. Could you please clarify what you mean by the following: ‘Trade pullbacks by finding minor 1-2-3 trading setups within a more significant trend.’? Hello Tom, it means viewing a pullback as a minor trend on its own and using 1-2-3 to trade the reversal of that minor trend. It will then bring you into a trade that’s in line with the larger trend. A close example is John Hill’s setup explored here. However, be careful as you review it to avoid confusion as it uses different terminology and is not exactly the same as the 1-2-3 pattern.